Your dog needs a dog house almost every single day. Depending on the place you live, providing one may be the most important thing you can do for him. Especially, if you live in an area with harsh winters. Then, you simply must find the best insulated dog house. 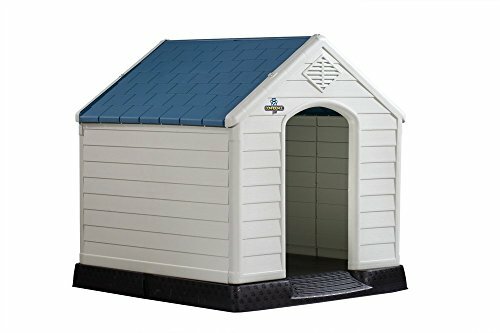 A dog house of this kind will protect your dog from frostbites, hypothermia and allow him to enjoy in a comfort which is similar to your actual home. 1.1 What to look for when choosing a dog house for winter? 1.1.6 Is it easy to set up? 1.1.9 Is it easy to clean? 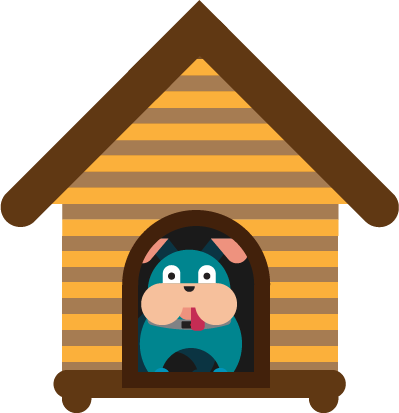 In essence, dog houses are a great way to make your dog happy and healthy. During the winter, he will need fresh water, which will likely be frozen unless it is in the house. Food shares the same issue. Try to always check if your dog has eaten all his food and if it is not frozen. Otherwise, dogs will eat less, which is a severe issue! In winter, they need more food, in order to produce body heat. The best dog house for winter time will eliminate all of these issues and make sure your pet always has the water and food. What to look for when choosing a dog house for winter? There are plenty of factors you will have to consider. Purchasing the best Insulated Dog House for cold weather is complicated if you want to ensure your pet gets a warm and desirable place to spend cold days. The insulation is the most important factor for dog houses for winter. The thickness of a few inches is sufficient, but, the more, the merrier. When it comes to keeping warm, any additional foam is an advantage. Of course, not all dog houses are insulated, so keep that in mind when looking for a new one. Raised or elevated dog houses are the best due to a simple reason. They don’t sit directly on the ground, which makes it warmer through the winter and cooler in summer. In addition, they also look better than conventional ones. How strong is a dog house? Some are designed to withstand all kinds of bad weather, while others are fragile. Pay attention to the materials and the capability to withstand tough winds. Nowadays, most dog houses are treated as durable, but for how long? This factor also depends on the materials and the build quality. Dog houses must be well-made and capable of withstanding rough behavior of a dog. All dog houses must be waterproof. Look for seller’s rating for waterproof feature. There are more than 7-9 elements in each dog house. Look for proper instruction and always check the time needed to assemble the house. Luckily, most models require around 2 hours for assembly. Two main materials are plastics and wood. Wood is durable and considered as a premium option. Plastic is cheaper and reserved for more affordable dog houses. A removable roof makes it easier to clean and to make additional adjustments. The best dog houses usually come with this feature. Furthermore, it helps you to reach your dog when he is inside. Look for materials inside the dog house. Plastics and wood are common and easy to clean in general. Also, pay attention to the fabric, if there is any. You want solid materials inside because they are easier to clean. There are small, medium and large dog houses. A special type is extra-large models. An unwritten rule is that a dog house should have enough space for two dogs inside, to comfortably keep only one. 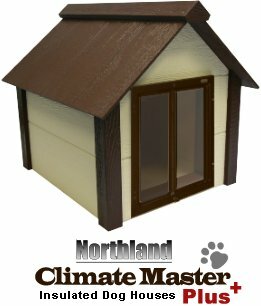 If a bit higher price isn’t an issue for you, this is the best insulated dog house for winter available out there. First of all, it comes with impressive design, which makes it look great and expensive. You can see ‘’dog palace’’ above the entrance and attention to details. Then we have a few, impressive additions. The house is superb when it comes to insulation. Each element is protected with styro and additional elements. Even door is insulated. In addition, the door has a self-closing feature and they will keep cold air from the house at all times. The dimensions of the house are 47.5 x 31.5 x 38.5 inches, so you get a large house, capable of accommodating even the largest dogs. What’s interesting is that inside, there is a 18x18 inches heater and a place for a small bed, for your dog, of course. In the lack of a better word, this means that your dog will feel warm even when the outdoor temperature is extremely low. 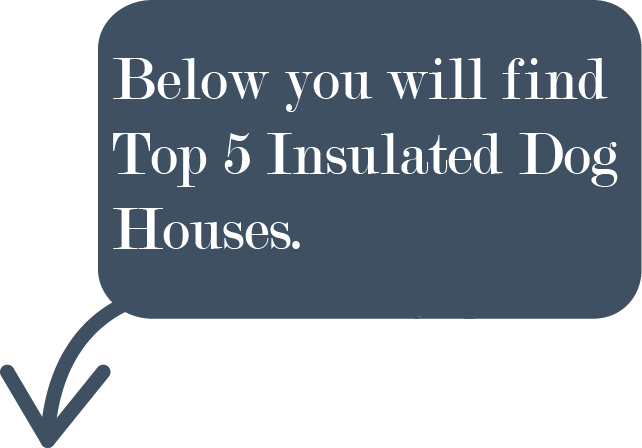 Paired with above average insulation, your dog won’t feel cold ever again, so we must recommend this house for homeowners who live in cold areas. The house is easy to assemble and easy to clean as well. You will need a couple of minutes to complete both tasks and to end up with a perfectly clean dog house. Furthermore, the floor is slightly elevated, which makes the entire dog shelter even more appealing. Yes, the house looks complicated to set up and maintain, but it isn’t. What if you are looking for a shelter for a dog which features classic design? In that case, you are going to need a house which we have here. It is more than just appealing and desirable to users all over the globe. What’s the main advantage is the PanelAbodeTM Laminated Engineered Panel System. It makes the entire house more durable than ever before and provides better insulation for your pet. The warranty here is 5 years and all products are made in the United States. In addition, this is a simple house to assembly. On average, you are going to need 10 minutes. The house has 36 3/4″ x 39 3/4″ x 37 3/4″ dimensions and it is around 106 pounds heavy. This made it superb for large dogs, up to 100 pounds. Your dog will love spending time inside this house. It is comfortable, looks great and it is spacey. Cleaning the house is simple and requires less than 10 minutes per cleaning. The door is well-made, they are self-closing and they will keep cold air outside. The house is weatherproof and it can withstand heavy rain, snow, and wind, thanks to the construction. You will be the owner of a great dog house which comes with all the essentials your dog will need. Furthermore, dogs are known for preferring this type of houses, simply due to the design and the fact they are made from wood. In a nutshell, your dog will enjoy in great comfort and be in a nice place through the winter. 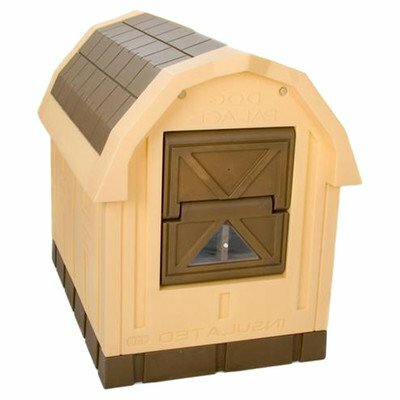 We must add that this manufacturer also offers other versions of the dog house in question. They vary in size and in features. Here we have one of the most original dog houses ever. It is known for a great design which is effective as well. First of all, the design keeps warm air inside, in the main chamber. The doorway and the first chamber are there to keep cold air out. The entrance is 15.5″ X 14.5″ making it suitable for medium and small dogs. Keep in mind that there is a vent on the roof, which is highly desirable. Paired with a system which eliminates the odor and stains, you won’t have to maintain this dog house frequently. On the other hand, the assembly process takes less time than ever before. 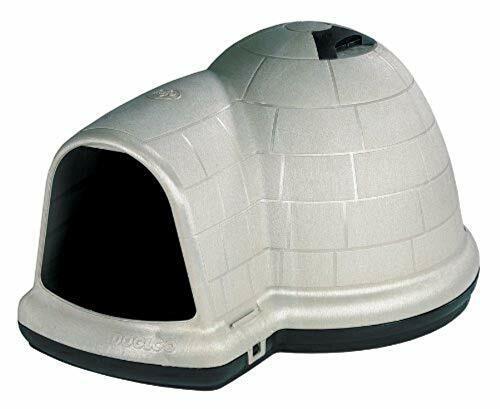 This is a large igloo dog house with 43.8 x 34 x 25.8 inches dimensions. It is extremely practical and easy to use. Dogs love it thanks to the vent on the roof and the main chamber which is a bit isolated compared to other dog houses. During our igloo dog house review, we were unable to discover major issues with the original design. It is great for the lack of a better word and it has plenty of advantages to offer. The material is tough and makes the house durable and weatherproof, but at the same time makes your cleaning easier than ever. In the end, all we can say is that this is the best Insulated Dog House for dog owners who want to have something original and different. The house is a high-quality product which is practical, durable and which will stay usable for a long time in the future. You definitely won’t make a mistake choosing this model. As you can see, this is one, extraordinary, yet simple dog house. We liked a few things here. First of all, the inner dimensions are 41.3″ x 25.8″ which is an advantage. Thanks to the roof which can be opened, dogs with a weight of 75 pounds can use this house. Of course, it can be used for other animals, such as cats. Roof comes with hinges, so it will stay open as long as you need. 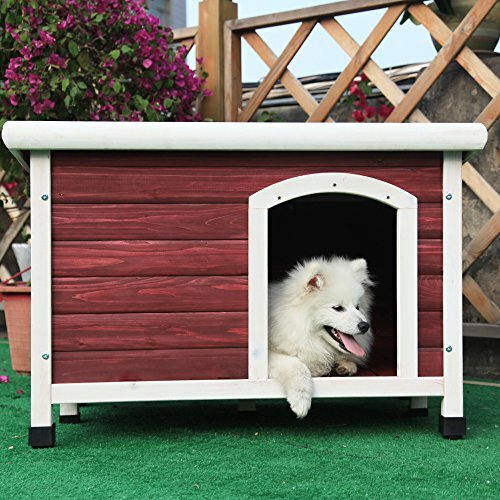 It is nice looking dog house for outdoor use for small and medium dogs. All holes that are needed are pre-drilled, meaning that assembly process is simple. You will need less than one hour to complete the process. Keep in mind that there are two, a bit smaller versions of the same house. They are assembled in the same way. One of the most important facts is the insulation, this dog house is slightly elevated in order to keep the moisture outside. It is easy to clean, yet it will keep your dog warm at all times. The interior is durable as well, same as the exterior of the house. Other facts you should know is the water-based paint. It protects the house from the elements, but it is safer for pets than other, conventional paints. Materials are weatherproof and they include cedar and asphalt roof. This is a great shelter for your dog. The house is made from a special type of plastics, which is extra durable and can withstand all types of bad weather. We also liked the fact the manufacturer spends extra time in adding some small improvements which make the house safer and more appealing. For example, your dog will get the safe type of flooring. Another interesting fact is the range of sizes. It starts from 29 x 26 x 27 inches, (entrance 10.5 x 17 inches) and it reaches 41.3 x 38 x 38.7 inches (entrance 14.1 x 24.6 inches). Obviously, this means that the house is suitable for larger breeds. Now we have the assembly procedure. It is more than just simple and it will require a few minutes of your time. The insulation of the house isn’t among the best we saw, but it is decent. The floor is a bit elevated, which makes a nice ground insulation. What more, the entire house looks well-made and you can see the quality. After assembly, your dog will enjoy the time which he spends inside it. Cleaning the house is especially easy due to the fact it is made from plastics. All materials of this type are super easy to clean. One of the best advantages here is the entrance. It is extra-large, meaning that your dog won’t have any issues getting in. The design is appealing as well. You get a nice house with modern exterior and with plenty of capabilities. Dogs are known to like this type of houses as well.